Tiago: "Cap off a great year"
We saw you running yesterday. Are you injured? I felt a little pain in my right knee ligament but it will pass. I think I will be operational on Sunday evening. 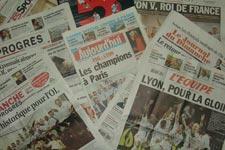 How did you cope with the double eliminations against Milan and Marseille? The were both very hard. The elimination in the Coupe de France will be hardest to overcome because it was the players’ goal to win it… but that’s life. We’ve moved on. In the changing-room, is the atmosphere still a bit morose? You play PSG this Sunday. What do you think of this match? It’s a big game for several reasons. First of all because we’ll be playing against a great team., and then we could be crowned champions. It will be very important. The team wants to finish in style and beat Paris to cap off what has been a great season. PSG means Pauleta. What can you tell us about him? He’s a great player and great man that I know well. I’ll be very happy to see him against on Sunday. Have you spoken on the phone? Not yet, but we will on Sunday, I can assure you. If you could tell him something what would it be? That I’m going to be crowned champion at his ground and that I’m going to celebrate winning the title at his ground. Now that there’s only the league games left, have you started thinking about the World Cup? I’m not thinking about that yet. OL still have several important games. I’m 100% Lyonnais for the moment. All the same, the World Cup with Portugal will be one of the highlights of the season for me. The first goal is to get out of our group, after that we just have to prepare for each match at a time. 17 goals were scored in Week 34: 15 from inside the penalty are; 3 headers; 3 penalties; 0 free-kicks; 6 from crosses; 0 from corners; 2 from free-kicks; 36 yellow cards and 2 red cards. 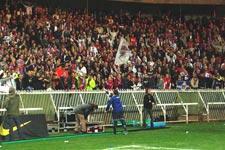 OL beat Nice 2-1 on Saturday, their 22 win of the season for a total of 75 points, five games from the end. Bordeaux, held at home by Saint-Etienne are now 14 points behind the future champions.